Finally! Thanks to facebook, a mystery is solved…it’s Camp Winnetka. Here at Broad Kaw Valley, we maintain a What Is It page in hopes of identifying mysterious (at least to me) Boy Scout items. One such item, shown below, has been in my collection for close to 15 years and I finally figured it out last week. 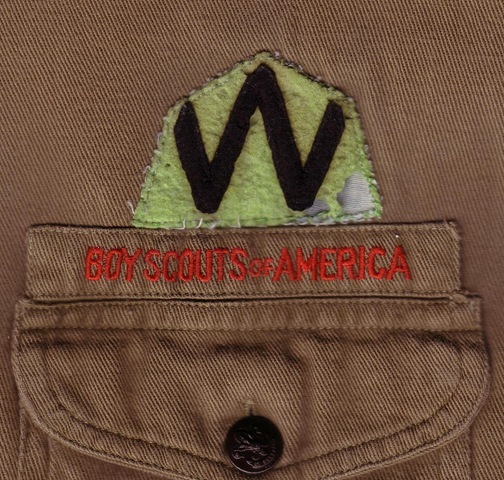 The felt “W” patch shown in the image was found on a shirt with a khaki and red “Macon” community strip at appears to date from the 1930s. I posted a link to the What Is It site on patch-L and received response that it might be from Lake of the Ozarks Council which was based in Jefferson City, Missouri and that the patch was featured in the June 2003 ISCA Journal with a “Boonville” khaki and red strip. After a few searches, I came up empty…so I turned to facebook. I became a fan of Great Rivers Council (based in Columbia, MO) and posted the image on the wall. Shortly thereafter, I got the response I was looking for: Camp Winnetka near Moberly, MO. A few more searches and I came up with a good case: Moberly is 25 miles south of Macon and 40 miles northeast of Boonville. The patch has been found on shirts with Macon and Boonville khaki and red strips. Also, I found an article from 2008 about a Macon, MO scout troop celebrating its 75th anniversary. It references Scouts meeting at Camp Winnetka near Moberly in the 1930s before moving into the basement of the Macon United Methodist Church. My conclusion? Camp Winnetka sounds like a pretty good match to me. If you have any additional information on Camp Winnetka or need help identifying a patch, please contact me. Here’s an interesting item from 1965. Until a few weeks ago, I had never seen one of these. Does anyone have any information on this event? When in 1965 was it held? Was it only for deaf students? Was it exclusively for deaf Scouts? Do you have one of these in your collection? What schools made up the Heart of America Schools for the Deaf? Do you recognize this neckerchief? 1971 Paul Bunyan camp out? Troop 71 summer camp neckerchief? Please email me if you have any information on this Whatzit.